I thought I would reblog this as an exhortation to pursue holiness (Heb 12:14); ‘work out their (our) own salvation with fear and trembling’ (Phil 2:12); deal with and repent of sin in our lives (Eze 3:18-21); refrain from compromise and hypocrisy in our faith walk; and pursue truth by diligently studying God’s Word for ourselves, that we be found worthy of Him (1 Thess 2:12). https://heulu.wordpress.com/2012/11/06/repent-return-and-remain-with-god-shofar-ebook-chapter-7/ A church’s ministry should serve 3 groups: unbelievers, believers that backslide, and believers. http://ligonier.org/learn/articles/preaching-wrath-god/ The whole counsel of God must be preached. God is God of Grace and God of Judgment. WHAT DOES OSAS MEAN? I recently discovered what OSAS meant when I came across this acronym from reading different posts. There are many Christians who subscribe to this teaching of ‘Once Saved Always Saved’, which is what OSAS means. 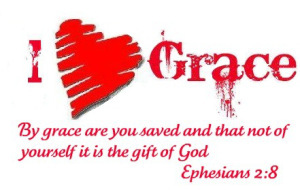 According to the scripture above we did nothing by ourselves to deserve God’s grace and gift of salvation. I certainly believe this to be true, that Jesus paid the price for our sins, calling us “out from darkness into his marvelous light” (1 Pe 2:9). . .